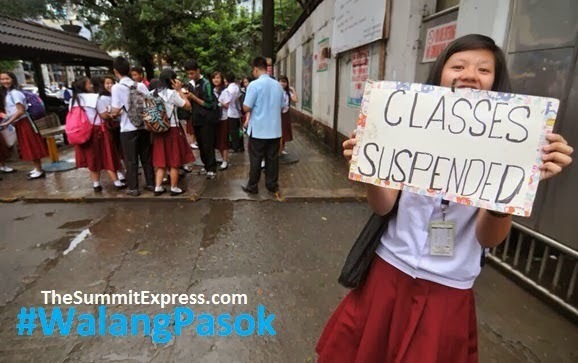 Manila, Philippines - Due to incessant rain brought by Southwest Monsoon (Habagat) affecting Luzon, Cavite local government unit (LGU) declared class suspensions for tomorrow, August 5, 2014. "Again, no classes tomorrow, Aug. 5, all levels in the entire province of Cavite. Intermittent rains are being experienced now in the province. Pls stay vigilant," Cavite Governor Jonvic Remulla announced on Facebook. In a weather forecast released by state weather bureau PAGASA as of 5:00p.m. today, it says that Metro Manila and the rest of Luzon will have occasional rains as Southwest Monsoon (Habagat) is affecting the land mass. "Moderate to strong winds blowing from the southwest will prevail over Luzon and Visayas and coming from the south to southwest over Mindanao. The coastal waters throughout the archipelago will be moderate to rough," PAGASA added. Meanwhile, Typhoon Jose has slightly weakened as it continued its path toward the northern regions of the Philippine Area of Responsibility (PAR). On the other hand, there will be no classes in Eastern Samar, Northern Samar and Western Samar on Tuesday, August 5, due to proclamation number 759 ( a special non-working day) in the regions. August 5 marks the 124th birth anniversary of the late Jose Avelino. He is a former Senate President and was known as the “Father of the Philippine Workmen’s Compensation Law” and was instrumental in the passage of significant legislation and the implementation of programs and policies that especially benefited the people of Samar. Executive Secretary Paquito N. Ochoa Jr. declared the special day for them to to celebrate and participate in the occasion with appropriate ceremonies.